This building was the “Caballo”, the water filtration house. Aquaduct water flowed through layers of sand and charcoal to purify the drinking water. Later this building was the city jail. 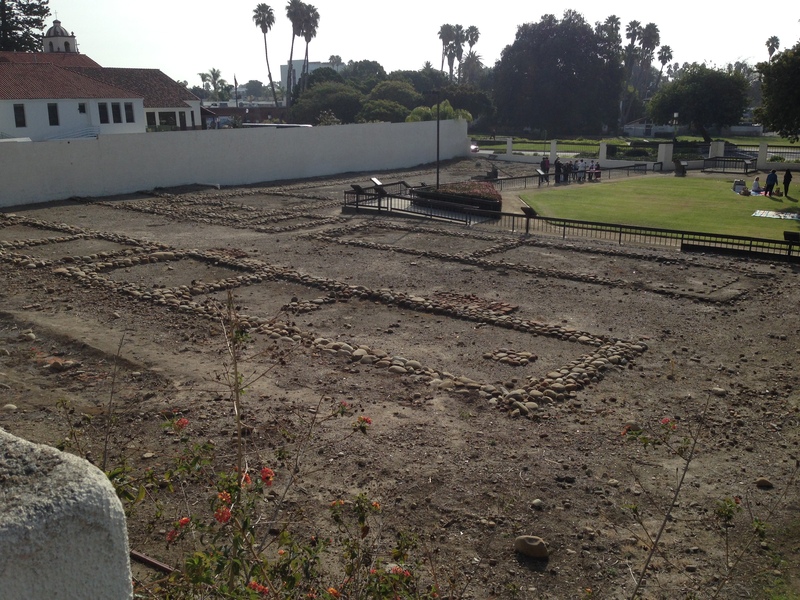 Today I chaperoned a 4th grade class trip to the Albinger Archeological Museum at Mission San Buenaventura in Ventura. It was an immersion tour. The “Padre” led the students,aka “Chumash neophytes”, on a tour of their new life of conversion and toil. The kids got hands-on experience carding wool, weaving on a loom, tasting heritage foods, adding a “rubric” to their signature, and playing the bells. By lunch time, my son and his buddies were hatching plans for building a time machine to escape the Mission and be free little Chumash runaways. The whole class was ultimately released so we ventured across the street to the park to eat lunch while watching homeless people sleep. Original foundations of the Mission Buildings. The “new” mission is just beyond the wall. I was on my feet all day. I’m counting this adventure as my Janathon workout for the day.